Late morning at the Eagle’s Nest. Before heading out on any road trip with my wife and 2 daughters, the routine is to use our garage floor as the staging area for all the items that need to get packed: Luggage, food, coolers, life jackets, coats, extra hiking shoes & boots, collapsed kennel for the dog, fishing tackle, etc. Staring at the items I thought – no way this will all fit. But, let the shoving, sliding, and stacking begin. The last item to get packed was a 1-piece fishing rod that still had a lure on it, but I didn’t think much about it. …I should have removed the lure. 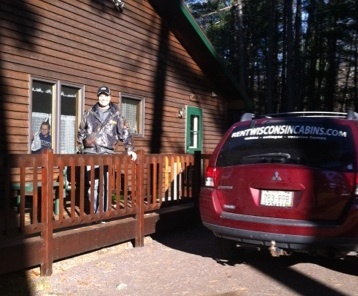 After 3 hours on the road we arrived in Minocqua, WI. 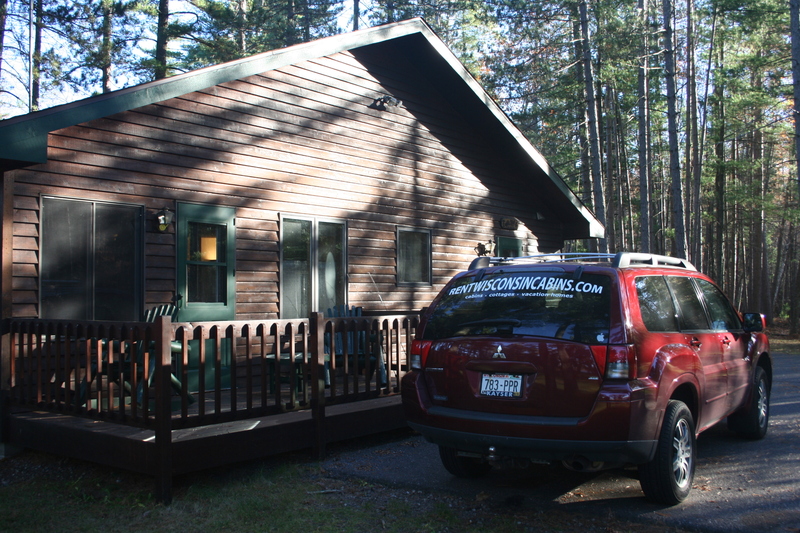 It was after dark, so winding our way through the thick northwoods and finding our cabin was going to be tricky (our first time to the Whispering Pines Retreat). We were nearly there, so our daughters started to perk up. Our 10 year old started bouncing around and her hair got stuck in the fishing lure. She was startled at first, than saw the humor in the situation. “You caught one dad” she said. 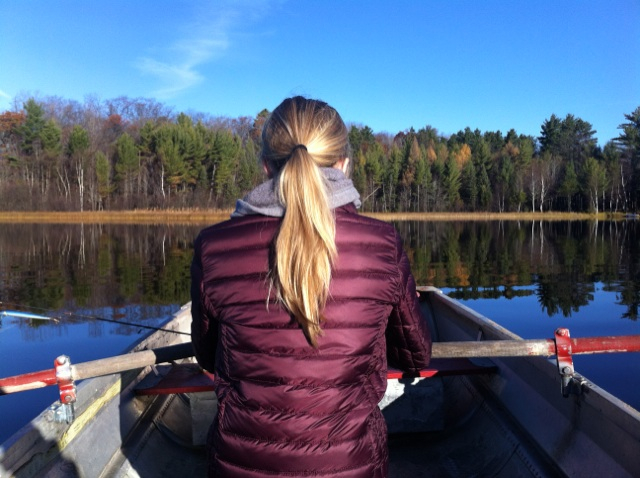 After some more joking and a quick stop to “release” her, we arrived at the Whispering Pines Retreat. Bear’s Den as seen from the lake area. Bear’s Den as seen when you enter the retreat. – then 200’ feet further was our Eagle’s Nest cabin. 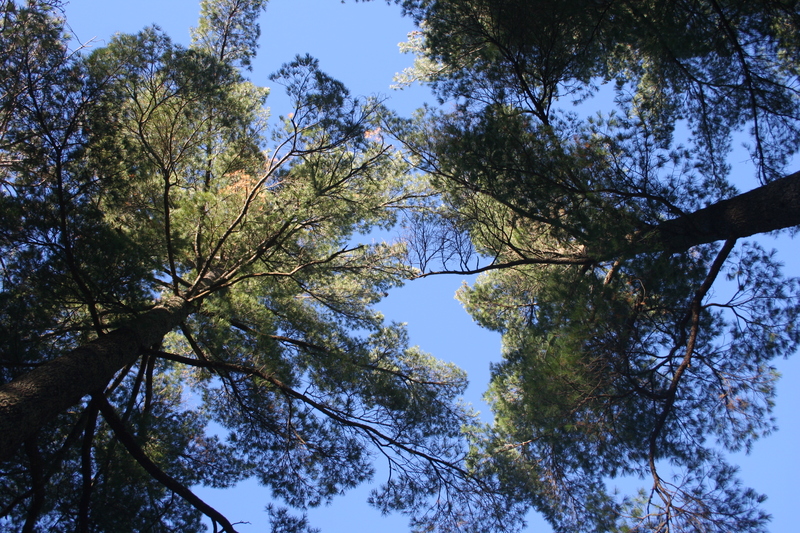 Thanks to a nice breeze, we were treated to the whispering of the pines. • Just as advertised, the rental is very clean. • The kitchen is well stocked. • The amazing 4 season porch (80% of it windows) stretches the entire length of the home. It has its own entrance too. Our dog spent lots of time here, sitting in the sun and watching squirrels. 4-season porch overlooks the yard and lake. • Satellite TV (which we rarely used). 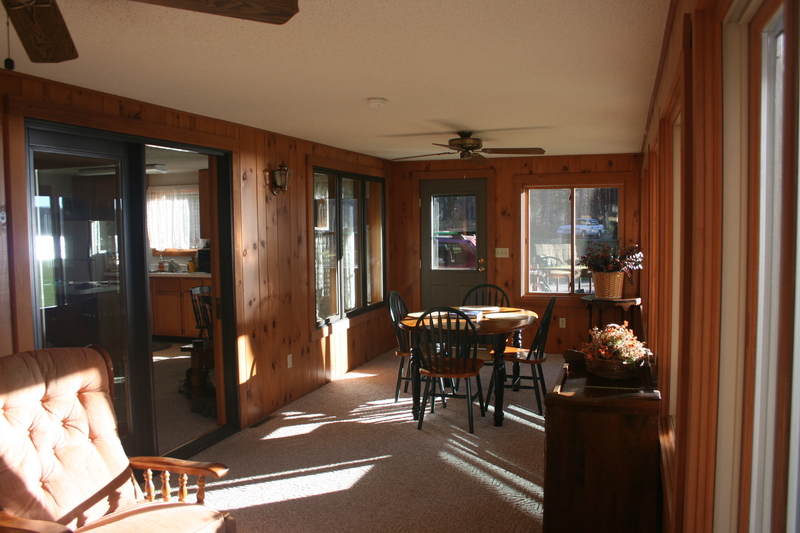 • 2 bedrooms with additional sleeping in the living room nook, and in the 4-season heated porch. Extra sleeping nook in the living room. Before I knew it, our daughters were unpacking their luggage – in the master bedroom! “Payback for leaving your fishing lure in a dangerous place”, said our youngest. Beach, boats, dock and a level yard leads to it all. • Sandy bottom and swimming raft. 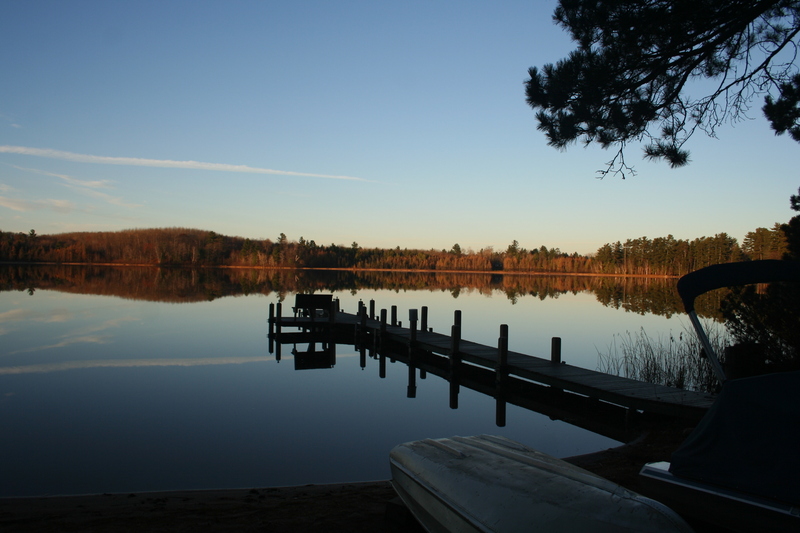 This is what “Cabin Time” is all about. • Located on a dead end street. No thru traffic is a bonus. 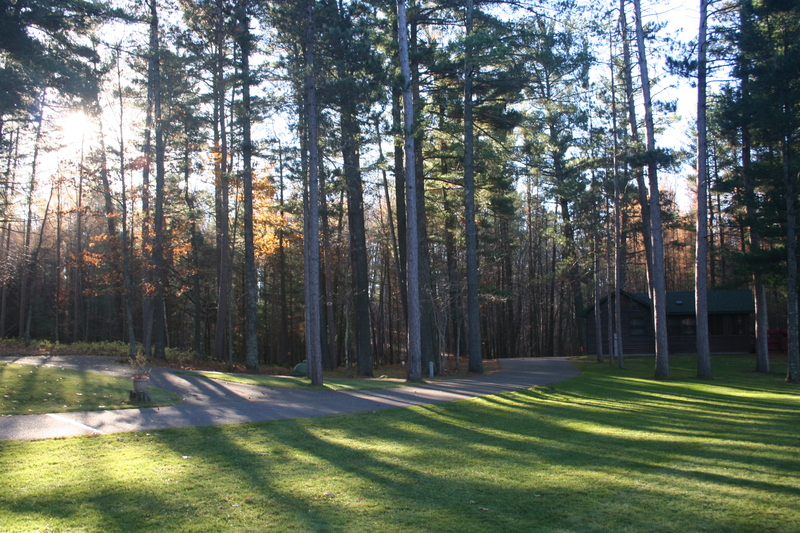 The grass yard between the lake and cabin was a great surprise and the kids used it to play soccer and Frisbee golf. 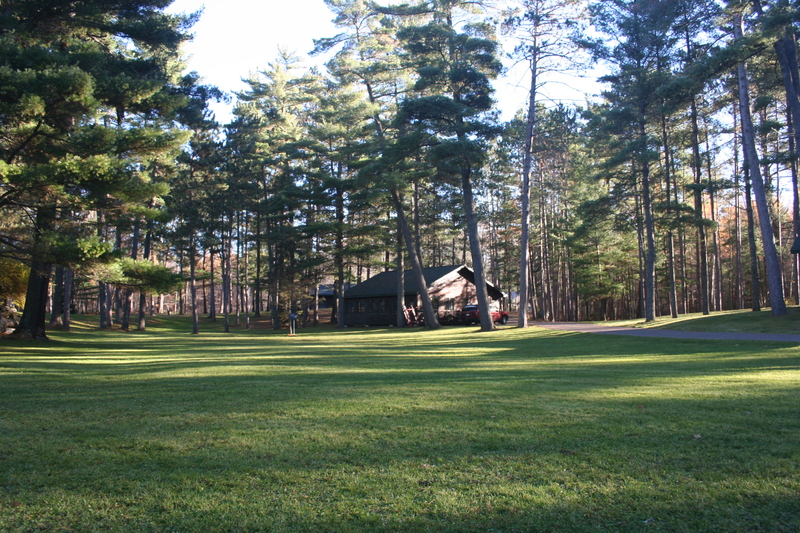 Vacation rentals create so many memories and Whispering Pines delivered a doozy: Our kids were sitting in the grass just outside the cabin when 2 deer walked within 20’, stopped and stared at them. We’ve stayed at a few vacation rentals, and you can tell when an owner/manager goes that extra mile to make sure renters have a great experience. Shari and Rodney are courteous and professional vacation rental owners. Their home is on the resort grounds, and so is their cleaning crew. Does that mean they’re always at your cabin? Nope. 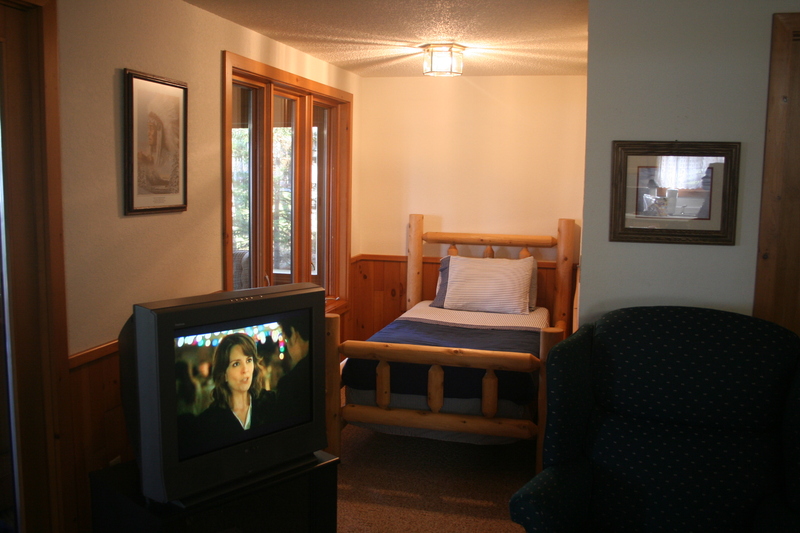 In fact, don’t be surprised if Shari tells you during check in that, “you’re on your own, but we are here if you need anything.” Make sure and ask them about things to do at the cabin and areas to explore nearby. They have plenty of tips on how you can “live like a local”. Since we ate at the cabin often, we appreciated all the extras: 2 types of coffee filters (my wife tells me the brown filters are healthier); supremely stocked kitchen with dishes, all sizes of pots and pans; washer and dryer; extra towels blankets & pillows; bags for clean up; lots of reading materials and much more. The lakefront had plenty of boats to easily plop in the lake. 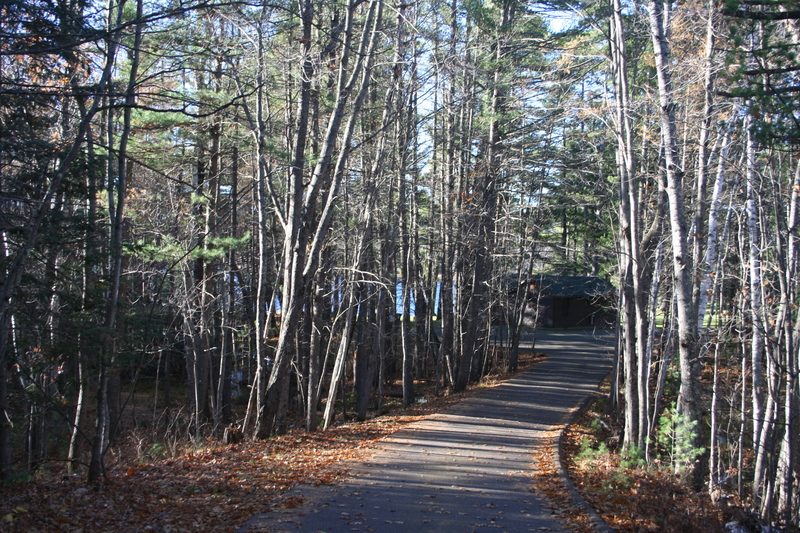 We enjoyed reading the guest book at Eagle’s Nest – that’s how we discovered the walking path around the lake. Sunrise as seen from the deck area. or the sunset. 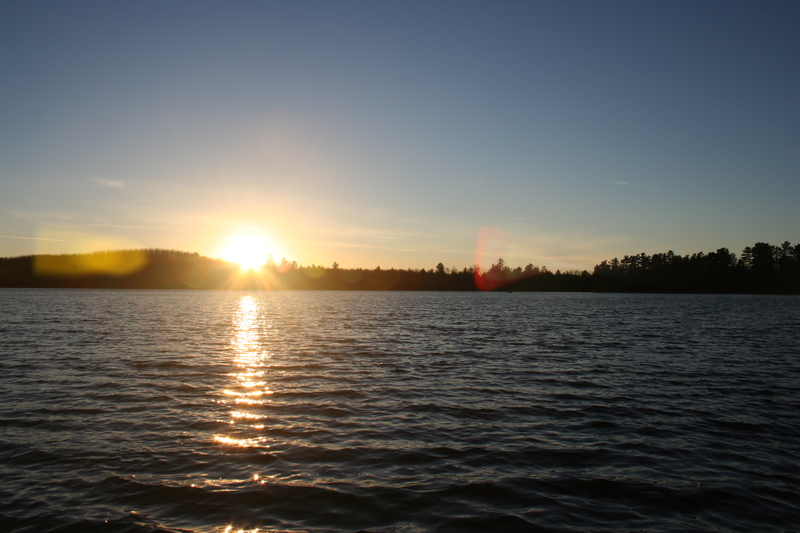 Watching the sunset over the lake (from the dock, deck, or 4 season porch) is something I could do over and over. Sunset as seen from the beach area. 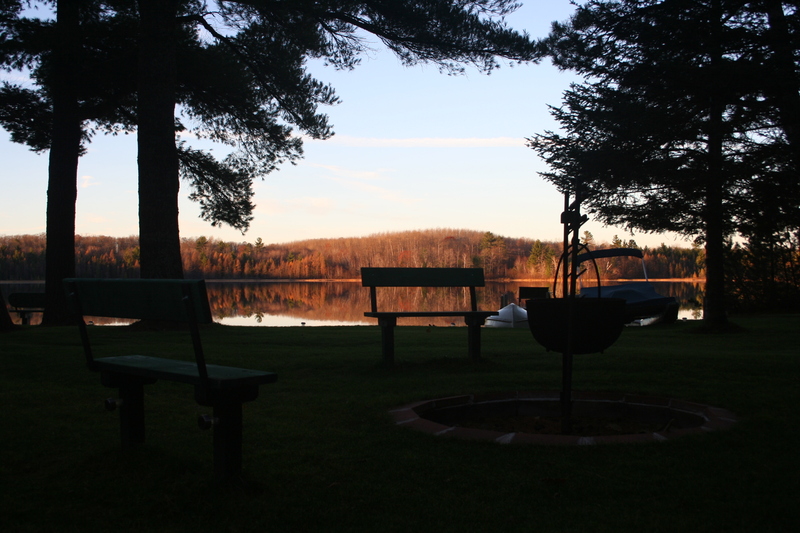 There is one other fishing resort on the lake: Verna Lake Resort. 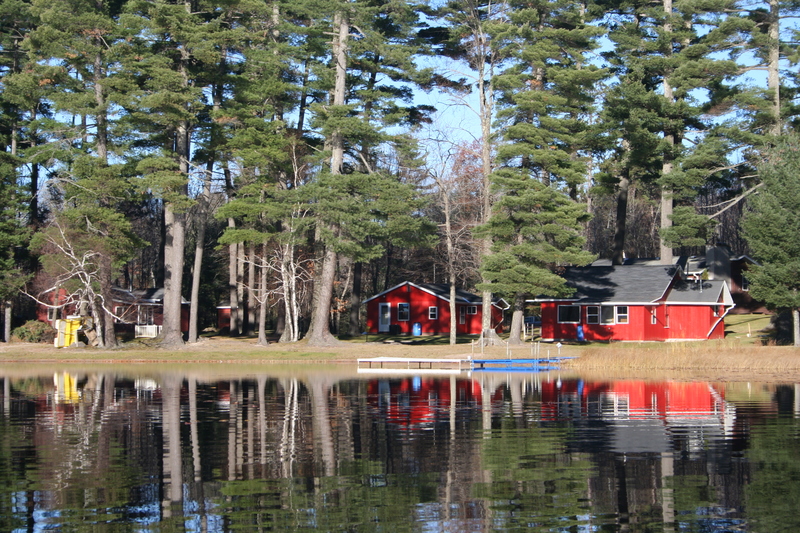 Just look for the vintage red cabins that reflect off the lake! 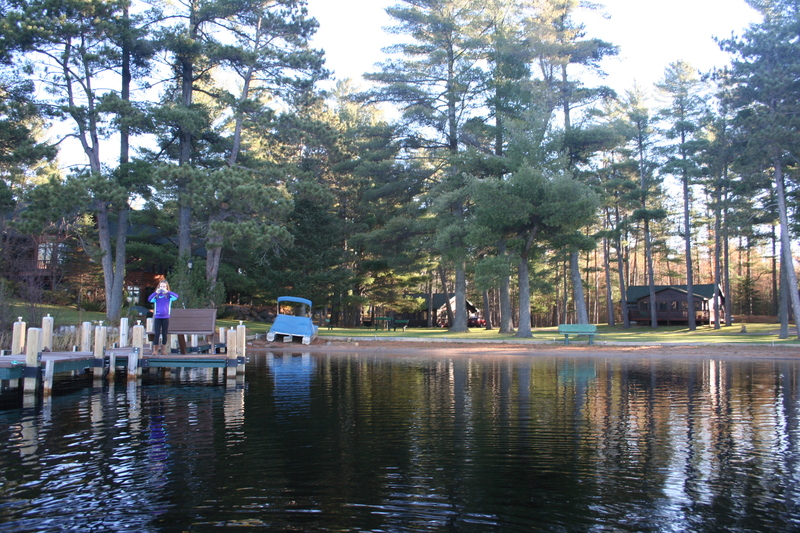 Also on Verna Lake is the Verna Lake Resort. 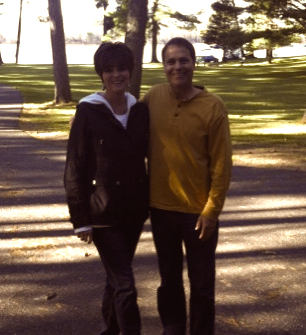 Thank you Shari and Rodney for the wonderful late October stay at your Whispering Pines Retreat Eagle’s Nest Cabin. What an increbible treasure. We hope to be back real soon. 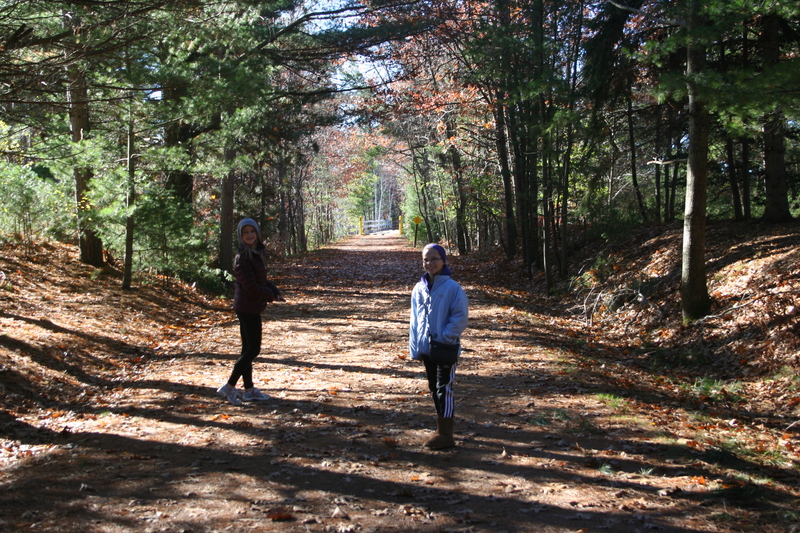 Exploring the Bearskin hiking trail. What a memorable sunrise this was.